As a lover of buffalo wings, I can’t believe it’s taken me so long for me to put this recipe together. 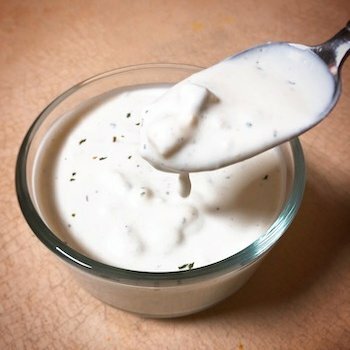 They deserve the proper homemade accompaniment: the creamy yet intensely tangy flavours of a homemade blue cheese dressing. I kept buying bottled stuff at the store because it was easy it because in my mind, why would I need to make it? Isn’t it inherently keto? If you look at the bottle, the first ingredient is soy bean oil and the fourth is sugar. So I set about to making my own blue cheese dressing recipe... and it WAAAY better than bottled stuff! Use it as a dip or throw it on any salad when you want that extra zing. Place the cheese into a small bowl and use a fork to break it up into coarse chunks. Add yogurt, mayonnaise and 1 tablespoon whipping cream and mix well. Let sit for a few minutes to allow the flavors to develop. Salt and pepper to taste. Dilute with water for desired consistency. Keeps for 3-4 days in the fridge.